Spain cedes Florida to Britain in exchange for return of Havana. Spain received Louisiana from France. The Anglo–Spanish War ( Spanish: Guerra Anglo-Española) was a military conflict fought between Britain and Spain as part of the Seven Years' War. It lasted from January 1762 until February 1763 when the Treaty of Paris brought it to an end. For most of the Seven Years' War Spain remained neutral, turning down both the French and British, but during the war's latter stages, the Spanish became alarmed at the threat posed by the British to their colonies as French losses mounted. In anticipation of the Spanish entering the war on the French side, the British attacked Spanish colonies. In August 1762 a British expedition against Cuba took Havana and western Cuba, then a month later the British seized Manila. The loss of both the capitals of the Spanish West Indies and the Spanish East Indies represented a blow to Spanish prestige. Between May and November three major Franco-Spanish invasions of Portugal were defeated and they were forced to withdraw with heavy losses inflicted by the Portuguese with British assistance. In South America the Spanish succeeded in taking a strategically important port town but otherwise the skirmishes with the Portuguese there changed little. By the Treaty of Paris (1763) Spain handed over Florida and Menorca to Britain and returned territories in Portugal and Brazil to Portugal in exchange for British withdrawal from Cuba. As compensation for their ally's losses, the French ceded Louisiana to Spain by the Treaty of Fontainebleau (1762). With evidence of growing Franco-Spanish co-operation, Pitt suggested it was only a matter of time before Spain entered the war. The prospect of war with Spain shattered the cabinet unity which had existed up to that point. Pitt strongly advocated a pre-emptive strike which would allow them to capture the annual plate fleet, denying Spain of its vital resources of wealth which were shipped in. The rest of the cabinet refused, and Pitt resigned. In spite of this war with Spain swiftly became unavoidable; by 1761 France looked like losing the war against Great Britain. Furthermore, Spain suffered from attacks by British privateers in Spanish waters, and claimed compensation. The original Spanish plan was to take Almeida and then to advance towards the Alentejo and Lisbon, but they switched their target to Porto as it would strike more directly at British commerce. Under the direction of the Marquis of Sarria Spanish troops crossed from Galicia into Northern Portugal capturing several towns. However, the thrust against Porto stalled in difficult terrain and due to the flooding of the River Esla. British troops began arriving that summer with 6,000 coming from Belle Île under Lord Loudoun and a further 2,000 from Ireland. 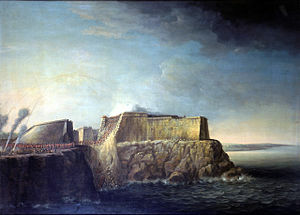 On May 9 Spain invested and captured the border fortress of Almeida. A British-Portuguese counter-attack led by John Burgoyne captured the Spanish town Valencia de Alcántara. French forces began to arrive to support the Spaniards, but like their allies they began to suffer high levels of attrition through disease and desertion. In November with problems with their lines of supply and communication the Bourbon allies withdrew and sued for peace. Despite the large numbers of forces involved, there had been no major battles. The Seven Years' War spilled over into Portuguese-Spanish conflict in their South American colonies. The South American war involved small colonial forces taking and retaking remote frontier areas and ended in a stalemate. The only significant action involving the British was against the Cevallos expedition, in which Spanish forces took and then defended the strategically important port town on the River Plate Colony of Sacramento. Almost as soon as war had been declared with Spain, orders had been despatched for a British force at Madras to proceed to the Philippines and invade Manila. A combined force of 10,700 men under William Draper set off from India in late July, arriving in Manila Bay in September 1762. They had to move swiftly before the monsoon season hit. On 6 October the British stormed the city, capturing it. A large amount of plunder was taken from the city after the Battle of Manila. News of the city's capture didn't reach Europe until after the Treaty of Paris; as such no provision was made regarding its status. During the siege, the Spanish lieutenant governor had agreed to a four million payment in silver dollars to the British known as the Manila Ransom in exchange for sparing the city. The full amount however was never paid when word of what had happened in the Philippines reached Europe. The British expedition however was rewarded after the capture of the treasure ships Filipina, carrying American silver from Acapulco, and in a battle off Cavite the Santísima Trinidad which carried China goods. The cargo was valued at $1.5 million and the ship at $3 million. The Spanish government demanded compensation for crimes committed against the residents of Manila during the occupation and the controversy over the ransom demanded by the British and the compensation demanded by the Spanish lasted many years. The twenty month occupation of Manila ended in 1764. David F. Marley (2008). Wars of the Americas: a chronology of armed conflict in the Western Hemisphere, 1492 to the present. 1 (2nd ed.). Santa Barbara, California: ABC-CLIO, Inc. p. 441. ISBN 978-1-59884-100-8.